Update time for the Lamborghini Huracan, the Sant’Agata specialist’s compact V10 supercar having been on sale since 2014. The facelifted, fettled 2019 model is called, logically enough, the Lamborghini Huracan Evo. You can read more news and details on the updated Lambo here. Or read on for our full review. So, what’s new on the 2019 Lamborghini Huracan Evo? Quite a lot – this is more than a mild facelift. The exterior changes are easy to spot. At the front, the bumper has been entirely reprofiled, largely in the name of improved aerodynamics and cooling, and at the rear, the spoiler has become a slotted double-decker ducktail, to better extract hot air and massage the flow of exhaust gases (from new, higher-mounted outlets) as well as increase downforce, above a new diffuser design. Under the floor too, there are new deflectors to increase downforce without significantly penalising drag. Overall, Lamborghini chief technical officer Maurizio Reggiani claims a seven-times improvement in downforce compared with the previous standard Huracan. Inside, a new touchscreen embedded in the centre console replaces the previous button and dial-based controls for infotainment, climate control and more. Wait, there’s more. The biggest changes are the bits you can’t see. Inside the engine, for starters. The Huracan’s wondrous 5.2-litre V10 remains naturally aspirated, thankfully, and is now, in essence, in the same specification as the formidable lump in the Lamborghini Huracan Performante, titanium intake valves, lightened exhaust system and all. As a result, it now delivers a heady 631bhp at an even headier (and fantastic sounding) 8000rpm, compared with just the 602bhp the previous standard Huracan had to play with. The Huracan Evo is also the first V10-engined Lamborghini to feature all-wheel steering. 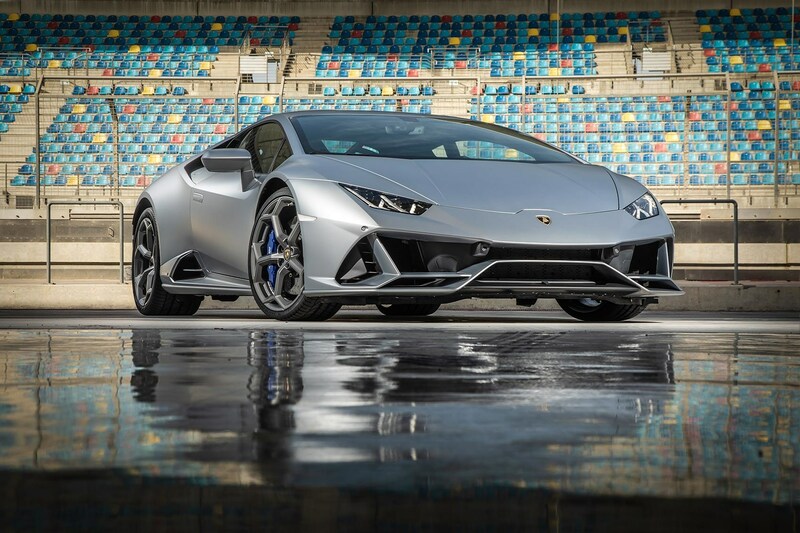 The system’s been seen previously on the Huracan’s bigger sibling, the V12 Aventador S and SVJ, but this is the first time the baby Lambo has steered from the rear, boosting agility at low speeds and stability at high – you know the drill. The rear-steer system is integrated into a complex suite of electronics, which comprise the other big news for the Huracan: a new computer control system. ‘We put a completely new brain in this car,’ says Reggiani. 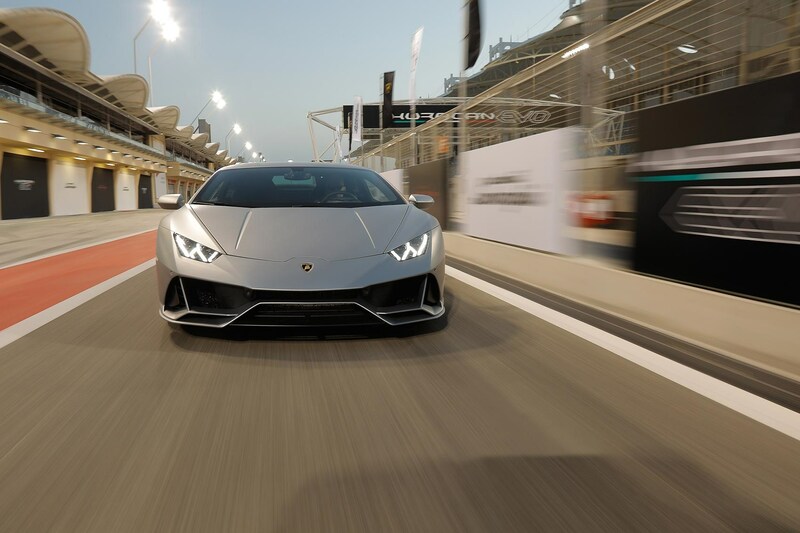 Said ’leccy grey matter is a new ‘predictive logic’ vehicle dynamics control system called ‘Lamborghini Dinamica Veicolo Integrata’ (LDVI), a CPU that controls all dynamic aspects of the Huracan. 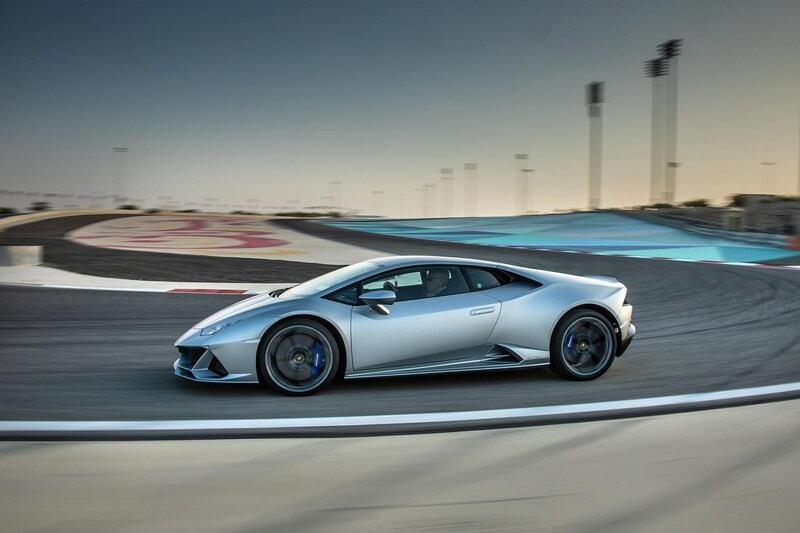 That includes its brand-new torque vectoring system (able to govern the powertrain’s torque split not only front to rear but also side to side, sent to the individual wheel that needs it most at any given time), its active suspension with electromagnetic dampers, its variable ratio electric power steering, and its various accelerometers and gyroscopic sensors which Lamborghini claim can pre-empt the driver’s next move by monitoring their inputs on the pedals, steering and transmission, and priming its suspension and powertrain accordingly. Yet more electronics… hmm. How does this all affect how the Huracan feels to drive? It’s changed it – for the better. The previous standard Huracan was one-dimensional to drive on the road, prioritising traction-biased understeer over front-end bite and feeling a little inert as a result. The Evo is far more nuanced, malleable and playful. 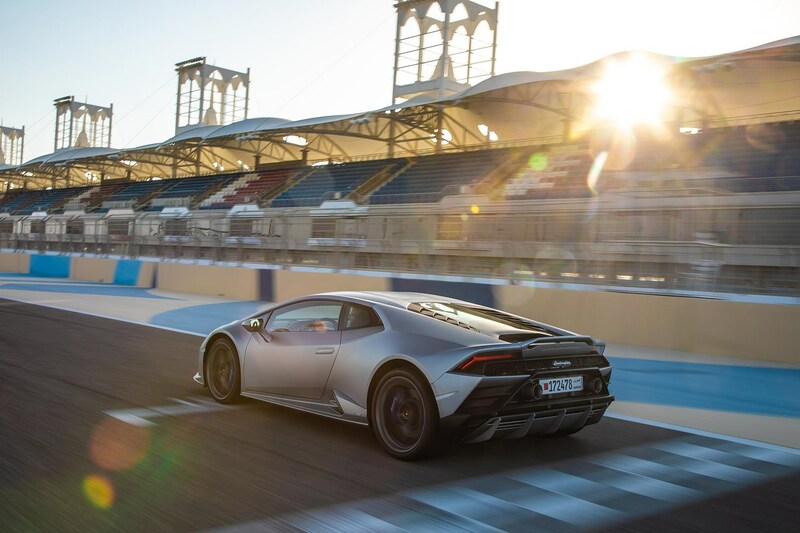 This first test took place upon the Sakhir Grand Prix circuit in Bahrain, and we’ll need to drive the Huracan Evo on the road to fully understand its capabilities as a supercar rival to Ferrari’s 488, McLaren’s 570S and Porsche’s upcoming all-new 911 Turbo. But the early signs are good. In the Bahrain circuit’s long, fast sweepers, its throttle response feels as sharp as ever, with no turbochargers to blur the precision of the arc drawn by your foot on the floor-hinged throttle pedal, and the bellowing 5.2-litre V10 feels every bit as accelerative, and sounds every bit as good, as you’d hope. The other characteristic of the Bahrain circuit is heavy braking zones, its long underscore straights punctuated by Big Full Stops. The Huracan Evo’s improved aerodynamic balance front to rear shows in the braking zones, remaining stable under heavy deceleration. Get greedy and hit the brakes too hard and it can get loose like most road cars, but only under extreme duress and it’s easily corrected by the fast steering and modulated by the standard-fit carbon ceramic brakes. Variable-ratio ‘Dynamic steering’, previously an odd, artificial-feeling option is now standard fit on the Huracan (it’s the only way to integrate the four-wheel steer and various other facets of the LDVI system), but on the circuit it feels natural, fast-acting and feelsome. We’ll need to try the system on the road to see how natural it feels, but systems of this type have improved a great deal since the original Huracan’s launch. Turn in feels sharper than before, partly a result of the increased downforce over the front axle, partly the new-generation Pirelli P Zero tyres and partly the torque vectoring system doing its deck-shuffling thing. Stability in high-speed corners feels more race car than road car, no doubt a result of the increased downforce which thankfully hasn’t required outsized exterior spoilers. The Huracan still does the mid-engined thing of rotating if you get into a corner hot and need to lift, but it gives you plenty of warning and time to sort it out. As before, there are three driving modes, selected via a toggle switch at the base of the steering wheel: Strada, Sport and Corsa. Strada is the comfort-biased road mode, Sport the one to select if you fancy a bit of oversteer, and Corsa the fast-lapping max-traction, max-accuracy mode for track use. Traction in the latter mode is of the pull-your-face-off, pull-the-horizon-in variety, but in Sport mode the Huracan is surprisingly tail-happy, and easy to hold in a slide, its suite of electronic systems working in harmony to help you into a slide, if it detects that’s what you want to do, and get you out of it smoothly. It’s quite uncanny in operation – almost as if it really can tell what you want to do before you do it. Does the rear-wheel steering really make such a difference? We tested a pre-Evo standard Huracan and a new Evo back-to-back on steering pad and slalom tests and the new car feels markedly more agile, requiring less lock, finding its apex more quickly and hanging onto it where the older car washes into understeer, and carrying more minimum corner speed as a result. It’s made a difference. Back down to Earth, please. What’s the new infotainment system like? It works well enough. The interface is Lamborghini’s own system, developed in-house so they can update it as and when they see fit without going through a third party, and its party tricks include menus for the climate control, seat heating, Apple CarPlay (Android Auto is on the way, and can be retrofitted to early Evos at a later date) and web radio (so if you’re in Bahrain, as we were on the launch, you needn’t miss Popmaster on Radio 2). A telemetry function is an option, including two on-board cameras, so you can record your best laps on trackdays around the world and swap data with like-minded Huracan Evo-owning mates via a dedicated app. It includes voice control (and Siri if your iPhone’s connected), and a surprisingly effective fingertip shortcut mode when the car’s moving to help keep your eyes on the road. To alter the volume, trace two fingers up or down the screen; to mute it tap three. It’ll be interesting to see how well the system works on the road. The price is a potential stumbling block. After taxes, registration fees and the like, the Huracan Evo is expected to carry an on-the-road price of £206,000 in the UK when deliveries begin in spring 2019. That’s a lot of money, no question. For context, the launch Huracan cost £186,760 in 2014. The sublime Ferrari 488 GTB costs somewhere around the £200,000 mark at the time of writing, and the even-faster McLaren 720S not much more than the Huracan (while the McLaren 570S, a closer rival on paper, is more affordable than the Lambo). Is the Huracan as much fun as either? On the basis of this track-only first acquaintance, it’s far closer than it was in its original guise. It’s a pin-point accurate apex shooter in Corsa, or an oversteer-hungry hooligan in Sport. In short, it’s a fabulous plaything. Gut feel says the Ferrari is marginally more exciting, and McLaren’s 570 and 720 respectively offer purer and more visceral driving experiences. But to judge the Huracan in dispassionate better-than, worse-than terms is to miss the point. It’s always been an almost unbearably charismatic machine, and it now has the dynamic chops to back up its delectable styling and old-school engine. Chasing another Huracan Evo under the floodlights in Bahrain, blue flames licking from its exhaust and 5.2-litre V10 reaching for the stars, it’s hard to think of many more desirable cars on sale in the world today.